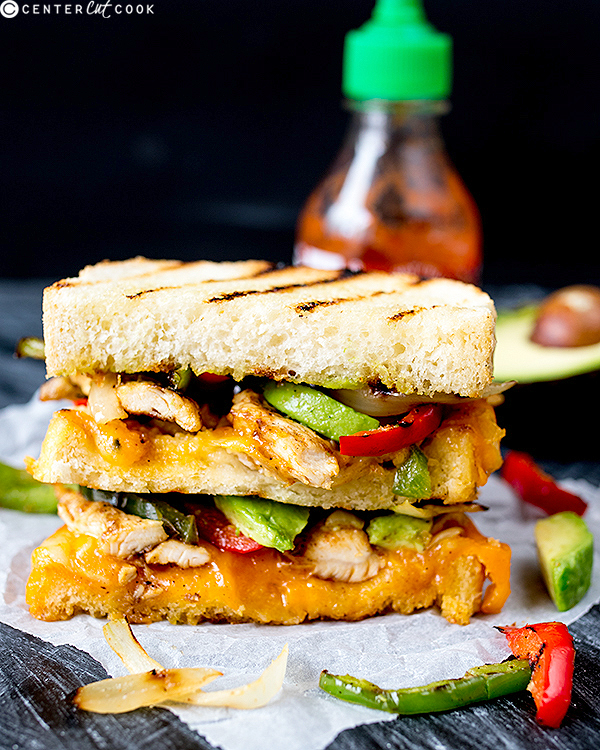 Spicy chicken, charred vegetables, gooey cheese and cool avocado. You need this for lunch! Sometimes the only thing that will hit the spot is a crispy, gooey, grilled cheese sandwich. Simple toast and cheese is amazing, but have you tried dressing it up? I love thinly sliced steak with red onion. Good old tuna-mayo with crunchy chopped veg is fab too (and a firm favorite with the kids). Just lately though, I’ve been slightly obsessed with avocado. This led me to a whole range of Mexican inspired meals, and I decided to test out some of those Mexican flavors with the classic grilled cheese. 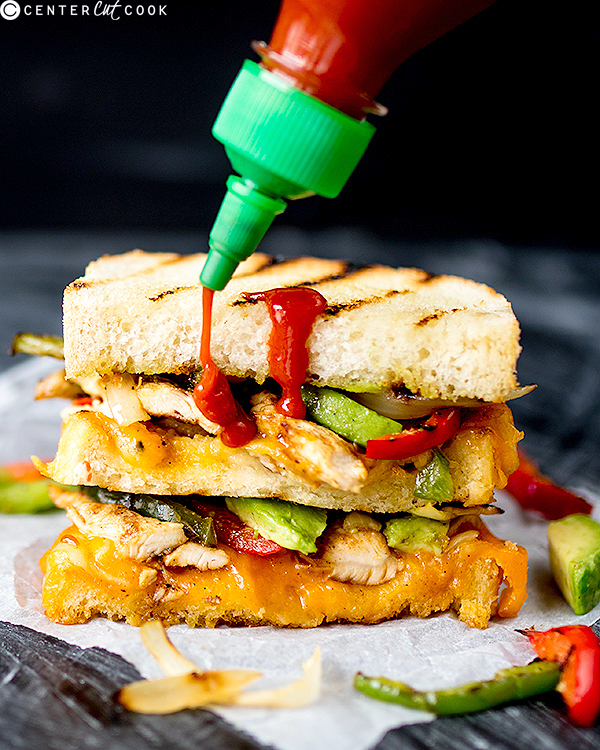 Spicy chicken, charred vegetables, gooey cheese and cool avocado. A total winner! Serve it with some sriracha, or maybe some sour cream if you don’t like it too hot. In fact with an over-the-top sandwich like this, I’d go with both! Preheat the oven to 400f and heat a lightly-oiled cast-iron griddle pan on the stove. Take the 3 slices of bread and brush both sides with the melted butter. Place on the griddle and for 1-2 minutes each side until the bread is lightly toasted and griddle marks appear. Take off the griddle and place two of the slices on a baking tray. Divide the cheese between the two slices and put to one side. In a small bowl, mix the sliced chicken, fajita spice and 1 tbsp of the oil. Place the chicken on the hot griddle in a single layer. Cook for 4-5 minutes until charred and no longer pink in the middle. Meanwhile, mix the peppers and onion with the remaining 1/2 tbsp of oil and place on the griddle too (in a single layer). Cook for 4-5 minutes until lightly charred. Place the bread with the cheese in the pre-heated oven for 2-3 minutes to melt. Put the plain piece of toast in the oven for the last 30 seconds to heat through. Now it’s time to put everything together. 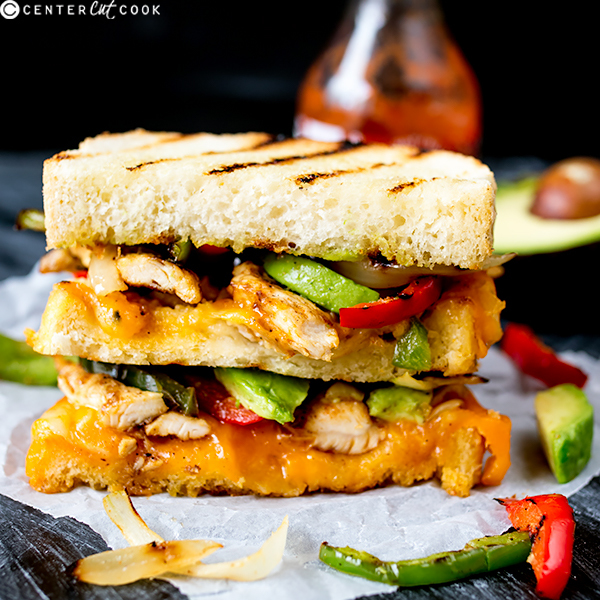 Place one of the cheese-covered pieces of toast on the bottom, top with half the chicken, peppers, onion and avocado. Repeat the layers, then top with the final piece of toast. Serve with a drizzle of sriracha.